A patent for this style of insulator has been found! Thanks to Lee Southern of Ontario. Read more about patent 244,124 issued November 4, 1924. One insulator that is rather interesting when it comes to Canadian porcelain insulators, is the large beehive with the metal cap on top. These don’t show up very often and they come in an unmarked very dark brown glaze and a “CP” skirt embossed white version. There is also a report of an unembossed white one, but an example of this can’t be located for verification at this time. The white insulators were made by the Canadian Porcelain company in Hamilton Ontario. There have been regular white unembossed beehives found on the site of the former plant, so it would not have taken much retooling to make this insulator with a hole through the top of the pinhole. The other style is more crude in appearance. These insulators are so dark brown; they are nearly black in color. They were made by the Medalta Potteries Ltd. of Medicine Hat Alberta. The Medalta company’s insulators are factory made, but their process involved a lot of hands-on labour, resulting in each insulator having a handmade look to it. I can only imagine the working conditions that these insulators were made under in the 1920s. These insulators sold for 7.5 – 10 cents each, yet they had to be handled by so many workers. There has been a rumor that these insulators were used on lightening rod applications. This however was not the designed application though. There could very well have been a few enterprising builders who used this style of insulator on a barn or old house. Back then many used whatever was handy to get the job done. There were considerably less rules and regulations. I have it second hand from a retired telegraph lineman out of Swift Currant Saskatchewan, that these insulators were in fact used to bring a signal down from an upper line through lower crossarms to the telegraph station, junction or contact point. These “feed through” or drop down insulators, were used by the Canadian Pacific Railway in western Canada. Medalta Potteries Ltd. is out of business now, but they made a wide range of items. Collectors look for their items and there is such an interest that there is a museum in Medicine Hat that has preserved many items of the factory’s memorabilia. Among the company papers, there is a series of letters that tell of the development issues Medalta had making these insulators for the CPR. As with almost any new product, there were tooling, material and learning problems during the development of this new insulator. Quality seemed to be the problem, rather than quantity. Later in the negotiations, CPR decided they wanted white insulators rather than the darker glazes that Medalta was used to making. Medalta’s clay tended to be more of a natural gray color, so their clear glaze was not exactly what the customer wanted either. Other problems that Medalta encountered included off center pinholes/conductor holes, shrinkage problems with the threads, wire groove flaws and tooling development issues. One letter from CPR to Medalta indicates that an insulator’s wire groove is perhaps the most important area of an insulator when durability is considered. L.O. Hutton of the CPR Telegraph in Calgary, states that in cold weather, insulator failures were frequent. It seems the wire groove area of the insulators were commonly being cut through by the telegraph wire. Presumably this was due to the wire contracting in the cold temperatures. Also in the correspondence is a reference to Medalta making a similar styled white insulator without the hole in the top of the dome. As far as we know, none of these insulators have surfaced in collections to date, so where these ended up is a mystery for now. Medalta suggested these experimental insulators be sent to other parts of the telegraph system for appraisal. CPR liked these insulators and made noises about buying 1000s of them if the price was close or better than the glass insulators coming out of Montreal Quebec for $77.50 – $80.00 per 1000. There are slightly more of the CP versions in collections etc, so it can safely be said that the supply contract ended up with Canadian Porcelain, after months of the Canadian Pacific Railway working with Medalta as a local supplier. It seems that there were several hundred of the metal-capped beehives made by the Medalta Potteries Ltd. They were distributed all over the west from Winnipeg to British Columbia in 1926. It is interesting to know that there were so many made, yet they are quite uncommon in the collections of today’s collectors. I guess this goes to show how many insulators have been destroyed or lost forever in undocumented dumps across the country. I would venture to say that the same % holds true for most styles of insulators. 1000s made, hundreds around, 100s made, a few dozen currently known etc. The principal of these insulators was that they insulated two conductors. Like most insulators, one conductor was wired into the wire groove on the side of the insulators as we see on the common CD 145 style. These special insulators however, were mounted on a cast hollow metal pin. The pin is embossed “PTD’D 1921”. The 1921 patent date, together with the known correspondence in 1926, shows that the concept of a pin type drop-down insulator was in development for quite a while. The16ga wire that ran down through the middle of the hollow pin was insulated with relatively thick rubber insulation and then wrapped in a thin metal, which was probably lead. The metal cover was probably there to prevent the rubber insulation from wearing and shorting out to the inside of the metal pin. 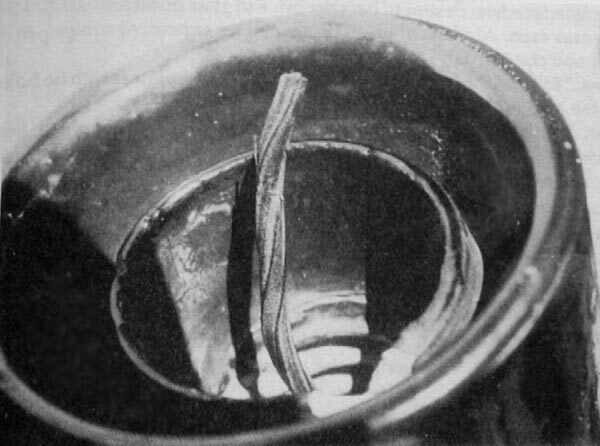 This wire was fastened to the insulator by a lead cap that pinched the wire in a hole at the top of the insulator’s pinhole and dome. CPR installed the wire and metal caps when the insulators were being installed on the lines. Presumably there were a few inches of wire sticking out the top of the insulator’s dome and the bottom of the insulator pin to allow the drop wire to be crimped on. 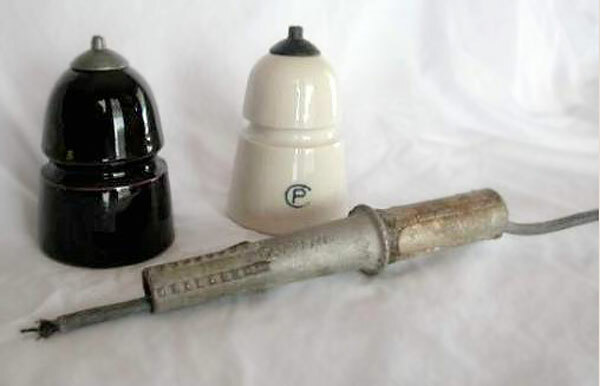 Most of the known examples of this insulator style have had the copper wire cut off flush with the lead cap for either salvage or display reasons. I would like to thank Dave Spencer and Daryl Heron for their extra effort in getting some modern pictures of these insulators and the details of how they were used. Credit is also due to the Canadian Insulator Collector Magazine (CIC), previously published by Mark Lauckner and Russ Paton. 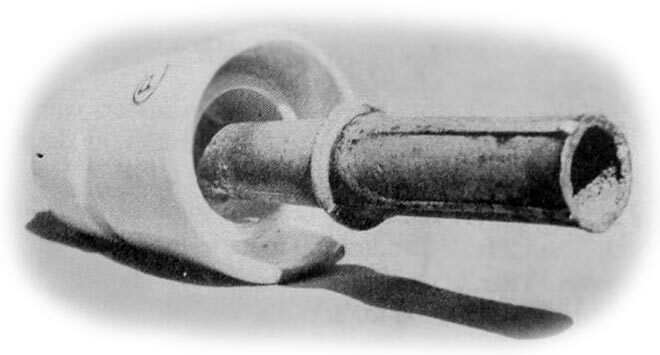 This column’s header insulator is a CD 106 styled porcelain insulator that was manufactured by the Medalta Potteries Ltd. This style is the most often seen Medalta insulator and is more common in the orange glaze than the white glaze. Photo credits for this column belong to Daryl Heron, Dave Spencer and the CIC Magazine.